We offer all the amenities in a quiet & convenient location. Located 7 miles from the NEW Typhoon Texas Water Park next to Katy Mills Mall. Our facility includes a 3 acre lake with walking trail. CLEAN, FRIENDLY & RELAXING! Positives: Excellent service and friendly staff, convenient access from I10, nice location outside of the city, level sites, good utilities Negatives: LOTS of road noise, lots of full-time residents, gravel sites that get messy when it rains, wifi doesn't work, low facility appeal. This park is okay if you plan to spend most of your time somewhere else, but does not have much appeal on site. We would probably only stay again for an overnight on our way through Houston. I’m rating this five stars even though it’s not a luxury resort. Most all are pull through level gravel sites. Brand new laundry & bath house with up to date tile throughout. Each shower/bath is a private room with commode, sink and plenty of shelving for personal items. It is wheelchair accessible . In addition the showers are located inside of the building which requires a code to enter. There is a playground, pool, hot tub, and fishing pond. Nice office with friendly staff. Large lounge. WIFI. Price was reasonable. There are some long term residents here, but their RV’s and sites are well maintained and it’s even hard to tell which ones they are. Highly recommend. And I’m very conservative with my five start ratings. Nice place to stay near Houston. We stayed here for a few days in Novemeber 2017 and then came back for a week in January 2018. The staff was friendly and check-in was easy. 50-75% of the site are people who live at the park. Some have wooden decks, yard barns, etc...but they are well kept. All site are pretty level gravel and pull through. Sites are big enough for any RV. The park has a nice sized pond with a path around it. The ducks that live there make it very nice. The park has a nice, small playground for children with plenty of space for running and playing. We did not use the pool or hot tub. They do appear to be older, but work. The park has two restroom facilities. The older one is adequate and well maintained. The new one has three private rooms which are all tile with a toilet, sink, and large shower in the room. VERY NICE. The laundry room is right outside these restooms. It also is brand new. Very nice machines ($1.25 wash and $1.25 dry for 45 minutes). Outside the Laundry/Restroom is a brand new professional quality dog wash. The park is a little hard to find (look for the water tower, it is right next to the park) and the area around it is not attractive at all. It is VERY convineint to I10. 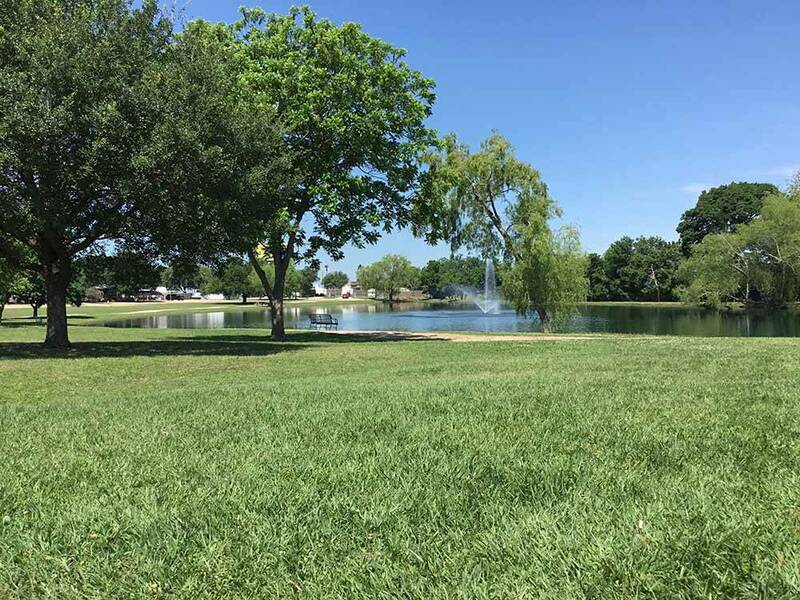 The park is about 10 minutes from Katy, which has everything you could ever need. It was about a 45 minute trip to downtown Houston. I would stay at this park again if I were in this area. Very nice park. Clean and neat. Very convenient. It was sufficient for one nigh, we arrived late afternoon and left early the next morning. It appeared that there were a lot of full time residents as children were being dropped off by school buses when we checked in. The RV resort was full of small children wondering around and riding bikes with no adult supervision. Facilities were adequate and clean, but there was road noise from I-10. Restrooms are very functional, not as pretty as some, but shower had a real sturdy grab bar and strong water flow. The laundry room is functional, washers are top loaders. The Park is quiet, not noisy.